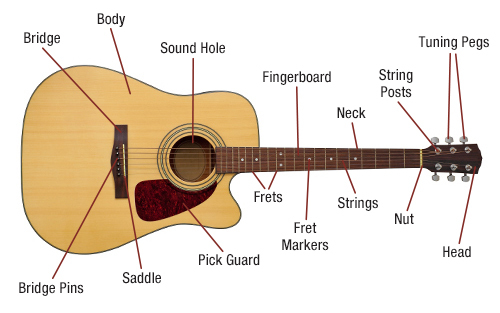 The acoustic guitar is different to an electric guitar as it uses only acoustic means to transfer the vibration from the strings into the air to produce a sound. The sound on an acoustic guitar is made by plucking the strings with either your fingers or a plectrum (also known as a pick). An acoustic guitar typically has 6 strings. The names of the strings are E, A, D, G, B and E.
The acoustic guitar is easy to set up. Always place your acoustic guitar in the case string side up and never leave it standing unattended against a chair or on the floor. Cleaning your guitar should be a very easy job. It always helps to have clean hands! You should also wipe the strings down after you play with a soft cloth. Sweat from your hands can weaken the strings. It’s very important to get the right size guitar for your child. Acoustic guitars come in all different sizes. An adult would play a full size 4/4 acoustic guitar, but children will need a smaller size to begin with. We recommend having your child measured for their guitar by your teacher or the store you have rented / purchased your acoustic guitar from. When the string is plucked, the vibrations from the strings set the air inside the guitar in motion. These movements are picked up and amplified by the body of the guitar, before exiting the sound hole and into our ears. How loud you play is determined by how hard you pluck the strings, as well as what type of wood your guitar is made from and its size. The acoustic guitar is versatile in the types of music it can play – classical, blues, flamenco and country guitar are very common and popular to the acoustic guitar.